A coarse, dull cooking knife makes your kitchen efforts wasted and you struggle instead of enjoying the process of cooking. And that is definitely not the best motivation to spend more time with your loved ones, chatting and crafting healthy meals at home. If you’d like to amp up your cooking skills, with more enjoyment making meals, having a few good knives on hand is essential. You only need a few to start with, and they don’t necessarily have to be the most expensive either. The best you can buy for your purposes is more important than their price tag. We’ve already covered the basics of Japanese knives (check our guide), listed advice on knife maintenance. We created a guide on choosing the right whetstone. We even analysed the types of steels used for kitchen knives. In this article we’d like to focus solely on chef’s knife. Japanese version of chef’s knife is called gyuto or wu-gyuto. Of course, you’ll need to know what makes a good chef’s knife ‘good’ in order to purchase the best one within your budget. Some say, that a chef’s knife is the home cook’s equivalent of a Swiss Army knife. In the end it should be ready and willing to perform any task given it. A chef’s knife, or cook’s knife, is a large bladed tool used in a variety of food preparation techniques. It was originally designed for disjointing large cuts, the long, tall blade was needed to handle the torque required to slice through tough cartilage and connective tissue. Nowadays, thanks to its unique design adjusted to today’s needs, it has become very popular as more of a general purpose knife and serves a variety of functions. One of your primary interactions with a chef’s knife is determined by the shape of the edge (as viewed from that angle). If you don’t fight the knife, will go a long way towards controlling how you use the knife and how it feels in your hand as you work. If you do fight the knife and try to work it in a way which doesn’t suit it, that will determine how it feels as well. The better your grip and knife skills, the more sensitive you’re going to be the knife. 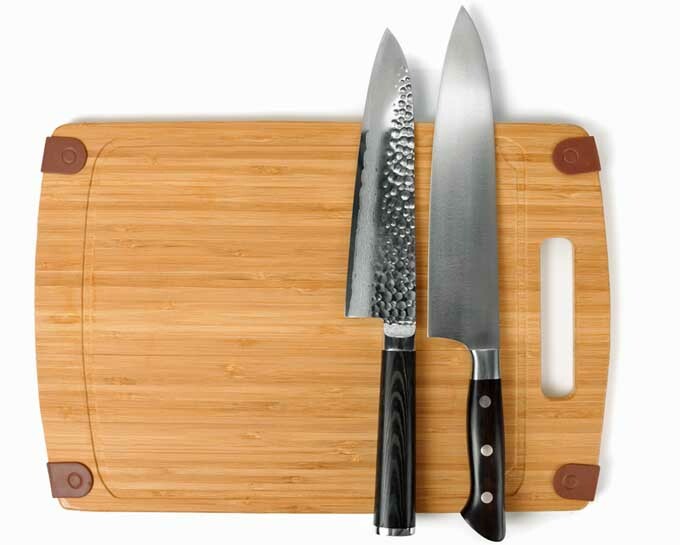 There are tree runner ups for the best kitchen knife for chefs and home cooks: Japanese, French and German-made. For the purpose of this article, we won’t be debating why Japanese knives are the best 🙂 and we will give a fairly objective guide on what each knife style offers. The actual shape of the blade is determined by the style it’s meant to emulate. If you’ll visualise a straight line from the base of the heel to the point of the tip, the area below this imaginary line is where the main difference lies. A French-style blade will have a straighter edge extending from the heel, before curving up to the tip of the blade – it has a truer triangular shape. German profiles have more arc (aka “belly”) throughout the length of the edge, while French blades are flatter — at least from the very back (heel) until the rise toward the tip. People often confuse the “width” or “height” of knife (distance from heel to spine, at the handle) with belly and profile. They think a wide knife has a lot of belly, or is German, or both. Belly is arc. “French” and “German” refer to how much and how the arc is distributed. As explained above, A German-style blade has a deeper, more continuous curve beginning at the heel and traveling all the way to the tip, which gives it more of a rocking motion – the area below the line has a wider angle, or a big belly. Japanese knife has a profile similar to either the French or German style, and comes in a variety of shapes for particular tasks. And, it will usually be thinner in the cross-section and lighter than its European counterparts, and is typically constructed of an exotic stainless steel alloy. In general, it will have a blade length of 210mm although many models will range in length from about 190mm to 240mm. Japanese blades are well-known for the hardness of the alloys used, and their extreme sharpness. A typical Japanese-style knife is ground to a 15 – 18° angle, while a Western style blade will have a less severe angle of approximately 20 – 22°. A Japanese style chef’s knife (called a gyuto) is on the left while it’s western counterpart is on the right. The Japanese version features a “wa” style handle and a traditional forging technique that is also quite useful for reducing sticking in proteins and starches. While we are biased, we must admit that none of these styles is inherently better than the other, and it really comes down to being a matter of personal preference. Previous Article	What are the best chef knives in the world?